Last year, we removed 4 (yes 4!) enormous agaves from what is known as the “hell strip” – the 4 ft area between a sidewalk and a street. It is referred to as such due to what it takes on – people walking on it, often blasting sun, reflective heat from the street and the concrete. The former owner decided to xeriscape it with 5 agaves which quickly outgrew the space and likely made a lot of people mad who parked there or walked by getting poked by agave thorns. We sadly dug up the agaves and all their babies and gave them to green waste and at some point will be in your Dillo Dirt. Then we were left with a hell strip of dirt. So, I decided to plant some annual Texas wildflowers from a packet my husband bought for me on a trip to Big Bend (see recommendations on seeds below). I scattered the seeds last year, in the Fall of 2010. Above is a picture of what we got in Spring of 2011. At a certain point (July-ish), the flowers stopped blooming and they got straw-like. I ended up cutting them down and there was an empty area where they were. To the left, you see the emerging wildflowers – this picture taken just a few days ago in November. I did not do anything to this area. What happened was it rained and the next thing I knew, I had little leaves popping up through the soil. 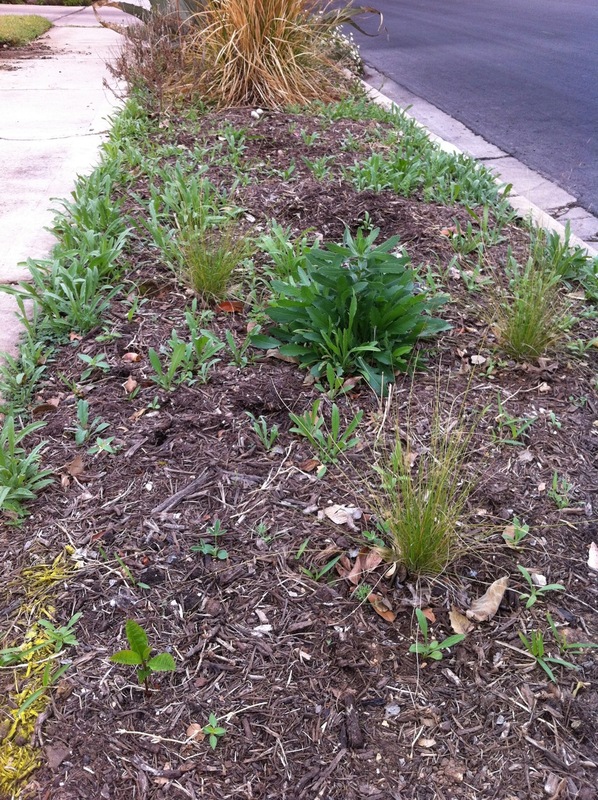 I did plant three new grasses – Gulf Muhly – in order for there to be more vegetation in the wildflowers “dead” period, which happens from about July – October. It is really simple to plant wildflowers and you can plant the seeds through November, so you have a few more weeks left to get on the task. 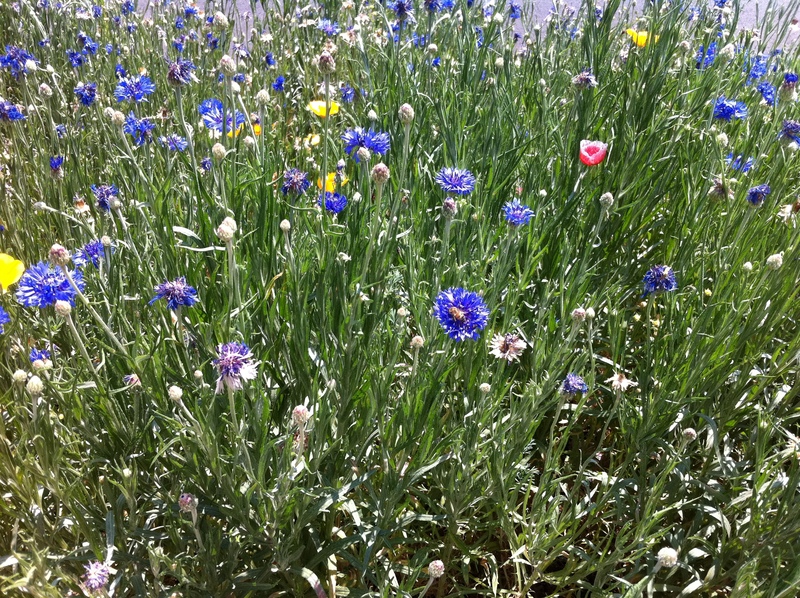 You can buy Texas native wildflower seeds at places like Barton Springs nursery or the Natural Gardener. Another great seed source is Native American Seed. These seed packets are usually a mix of different annual or perennial wildflowers. If they are annual, they do die each year, but they reseed themselves, so they come back again year after year, depending on conditions. My package contained 12 annuals and perennials including: bluebonnet, bluebell, penstemon, paintbrush, iris, coneflower, coreoposis, black-eyed susan, poppy, primrose, baby blue eyes, and marigold. Native American Seed has a mix of their own which includes black-eyed susan, clasping coneflower, indian blanket, lemon mint, mexican hat, prairie coneflower, plains coreopsis, and Texas blueblonnet. Once you have your packet of seeds, this is what you do. Disturb the soil a bit by raking it up with a strong metal rake or even a shovel. You don’t need to disturb it too deeply. The wildflowers will do best in “disturbed” dirt. I think that is why they liked my “hell strip” since we had definitely disturbed the area by pulling out all those agaves. Make sure there is no mulch and just dirt in the area. A few rocks are fine. 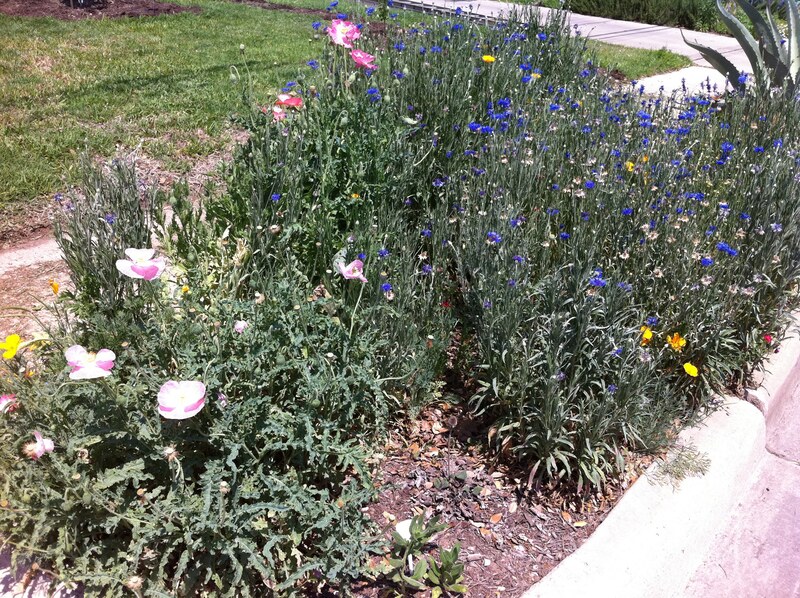 No need to amend the soil with fancy fertilizers – these wildflowers have lived in TX for a long time and do not need amendments. If you have mulch, you should rake it away from the area until the seedlings have sprouted and are above the mulch level. Then you could move your mulch back over it. Take your seeds and throw them in the dirt. You should note how much the package will cover in square feet or yards. This gives you a sense of how much of the package to use. The seeds go a long way! My package was for 350 sq. feet but I was only doing an area of about 16 sq. feet! If your seeds are very tiny and you feel you might lose the seeds on the way down, you can take a shovel full of dirt into a bucket or can. Mix the seeds into the dirt, and then distribute the seeded dirt onto the area. This also helps if you are doing this process on a windy day. Then rake the area again with little force just to move the seeds around the area. Do not bury the seeds! The seeds need to be touching dirt on 3 sides and 1 side air. So that gives you a sense that the seeds should be just below or at the surface level. You may choose to put a few more seeds down and rake them in again gently, just to make sure you’ve covered your area with seeds. Then walk over the area (have your little kids help out). Just walk around to tamp down the earth and dirt. You can let nature do its job through rain. Or if you want to urge your flowers along, you can water the seeded area once/day for 7 days until you see little dyadic leaves come up through the soil. During winter, you may only see a 1-2″ plant and that’s OK. The plant is growing DOWN into the soil deep during winter and developing energy for the big push UP when spring comes. In spring, you’ll get a great show. Wildflowers have a mind of their own. While you may plant an array of seeds, they may not all grow. Wildflowers will sprout if the conditions are right for them – and such conditions are different for different plants and a mystery to some degree. So you’ll get a show – but you may not exactly know what you’ll get!